Login to BSNL ERP Portal, submit your leave request for EL, CML, CL, HPL or EXOL or any kind of leave for you absence for duties, and extend the leave, or cancel your leave in ESS ERP login, if not required after submitting, and also check your available balance leave and total career’s EL / HPL credited in your account and availed leave history with new summary report available in BSNL ESS SAP NetWeaver portal. There are various kind of facilities and leaves to BSNL employees according to CCS rules and the same were credited to the BSNL employee service records and the same was available in ERP ESS portal at SAP NetWeaver login by showing the present balances and total career history, now we are presenting how to avail different kinds of leaves, presenting the joining report and extension of leave in BSNL ERP portal available for employee on their ESS login along with new Leave summary report. 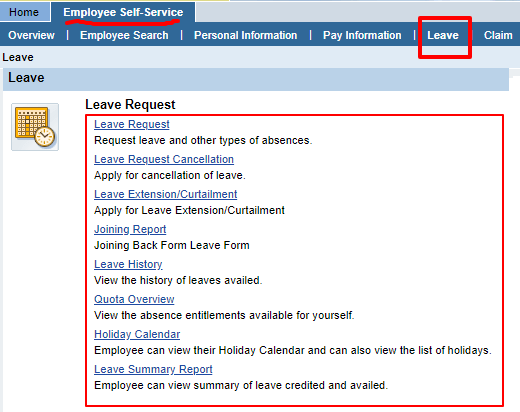 Leave Request > Request leave and other types of absences. Leave Request Cancellation > Apply for cancellation of leave. The employee of BSNL is having a chance for cancellation of leave request by presenting a leave cancellation request in BSNL ESS portal after applying of online leave from any source, just look the below about how to apply for cancellation of leave. BSNL ERP ESS portal also provides Joining Back Form in the SAP Login to complete the leave after availing Earned leave / Commuted leave or HPL, after the submission of joining report and necessary approval of concerned authorities only, the submitted leave will successful posted in all the service records of BSNL employee, have a look at how to submit joining report in BSNL ERP leave portal. An employee of Bharat Sanchar Nigam Limited can extent the availed leave before completion of leave spell, but this option can avail by the employee in BSNL ERP portal only after sanction of the applied leave (EL / Commuted Leave / HPL) by the controlling officer. Having a check on leave details in the form of leave history report which give the information about the total employee leave in ESS portal for which the leave already availed by a BSNL employee through ERP login, where here in this leave history report, an employee can check the balance leave against each quota also.